There I was, clicking away at chapter nine, when I came to a scene where Victoria learns that her cousin/ex-fiance Conrad is going to auction off some pieces of art and jewelry. 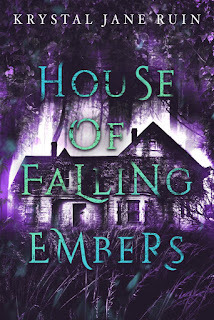 The proceeds are going to be used to renovate a derelict part of their old England manor, all so Conrad's bride-to-be, the American heiress Ursula, will feel more at home. 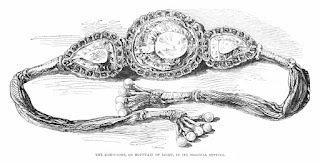 It would be a sweet gesture (you won't catch me describing Conrad as "sweet" very often), if the jewelry didn't actually belong to Victoria's mother. Victoria's Father had several magnificent items made for Mother in India. They weren't the Koh-i-Noor Diamond, but they were glittery and colorful, if her distant memory recalled correctly. Valuable, too. Mother had sent them with her to England for safekeeping. They'd been in the vault here for all that time. As we all learned in school, Britain had an empire, which reached its zenith under Queen Victoria. During the course of this Empire, the British gained (stole) a lot of their colonies' treasures. India was called the Crown in the Jewel of the British Empire. Is that because India produced some mighty gemstones? The Koh-i-Noor is a large (uncut, it was over a hundred carats), colorless diamond mined in southeastern India, possibly in the 13th century. It belonged to an Indian dynasty, then through warfare, ended up in the possession of other Indian dynasties before Babur, who established the Mughal empire, gained the diamond. 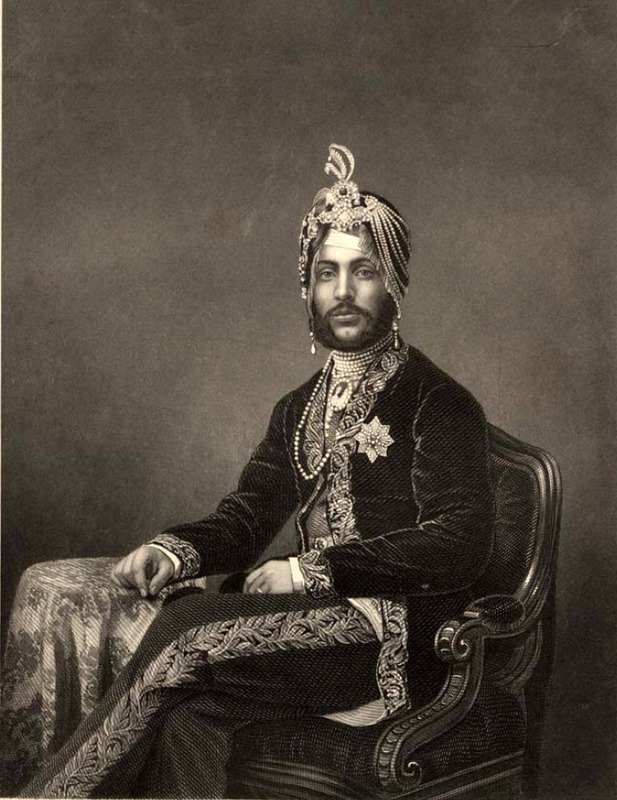 His memoirs are considered the first reliable mentions of the Koh-i-Noor. The stone was placed in a throne, but in 1739, the Shah of Persia invaded and took the stone. When he died, one of his generals had the diamond--this general was the Emir of Afghanistan and his son wore the diamond in a bracelet. The son was overthrown, but escaped to Lahore with the diamond. In exchange for hospitality, the former emir gave the Koh-i-Noor to Ranjit Singh, founder of the Sikh Empire. When the British acquired the Punjab--the land of the Sikh Empire--it acquired the Koh-i-Noor. The Treaty of Lahore, the treaty that annexed the Sikh Empire to Britain, stated that the diamond was to be given to Queen Victoria. 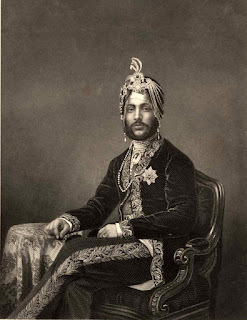 The Koh-i-Noor was presented to her by Duleep Singh, the last Maharajah of the Punjab and son of Ranjit Singh. (Duleep Singh, incidentally, lived in exile in Britain for his adult life. I may blog about him later.) It was presented to Queen Victoria on July 3, 1850. 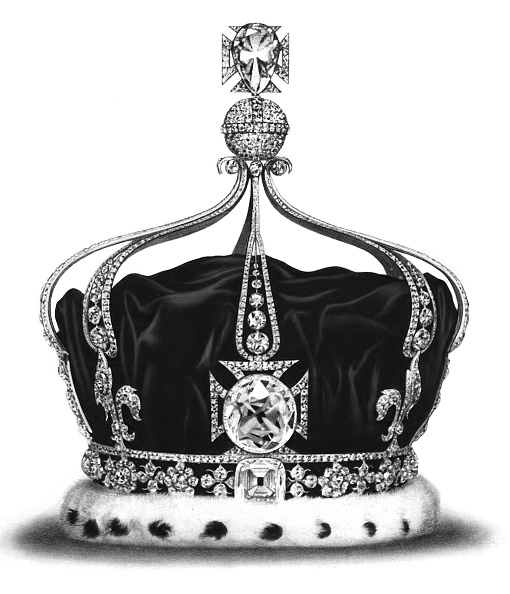 The Koh-i-Noor was recut and reshaped in 1852. 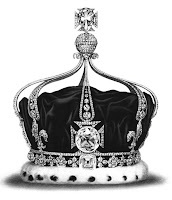 It became part of the Crown Jewels when it was set in Queen Alexandra's coronation crown, then in Queen Mary's coronation crown, then in the Queen Mother's crown in 1937--where it remains, on display in the Tower of London with the rest of the Crown Jewels. Since then, the governments of India, Pakistan, and Afghanistan have all claimed ownership of the Koh-i-Noor and have demanded and asked and asserted that the British should give it back--but the British say it was acquired legally in a treaty, so there. I fell into a research hole once sniffing around India. And all I really wanted was information on trade. I kind of want to slap Conrad right now, though. Lol! I was looking for more recent pictures of it and came across the clip, which is a far more succinct version of the politics involved with this diamond. Conrad needs to be slapped. Although he and Vic aren't on speaking terms right now. Oh wow. That piece of jewlwery has been everywhere!! It's kinda cool to see its journey and to know it has survived so long. Really under how Victoria is going to handle this with Conrad. My friend told me that this piece was also in Taj Mahal and it's supposedly cursed if men wear it, which might be why it's been in the queen's crowns. Well, colonialism. I wanted a way to remind whoever reads this that Victoria spent her her first years in India.